This is my Mother In Law's recipe. Spray a 6 qt. crock-pot with cooking spray, then add in all ingredients in order. Mix well, then cook on low for 6 hours. Stirring occasionally. 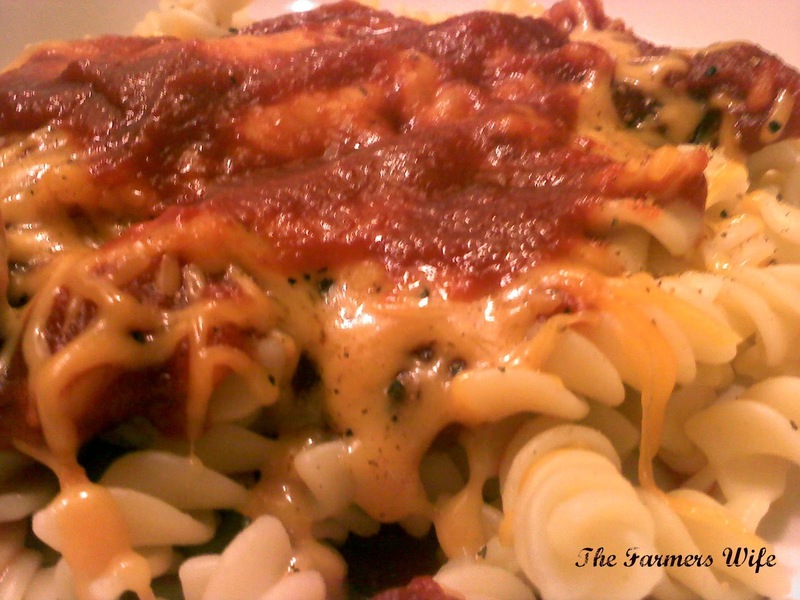 Serve over pasta and top with your favorite cheese. Told you it was easy! ;-) This is possibly the easiest meal you will ever make, and it is so tasty and cheap too. I mean how can you beat that? We like to use Rotini Noodles with this sauce, as it gets all the thick yummy sauce in each and every little spiral, and we also top it with Cheddar Cheese and a sprinkle of Fresh Ground Pepper. I know we're weird, but it's so good... And this is very kid friendly too! 5 stars. 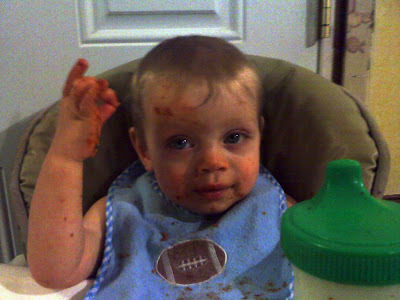 My little sous chef's first taste of spaghetti, 2 years ago! So happy your comment on my blog made me discover yours! You recipes sound amazing and to be perfectly honest, this post made me hungry. I cant believe how EASY this recipe is! Will try it, thanks!!! Oh I'm glad! I've often wondered over to your blog, I just never commented before. haha! I know this recipe is so awesome! I hope you enjoy it as much as we do! Wow, it's that easy?? YUM! Yes my little guy adores this sauce, I should've posted a picture of the first time he ate it, with sauce covering his face! lol! Maybe I'll add it in. It really is that easy, and it's so good! wowowo, so easy and it looks so delicious . This is awesome..usually I am using ketchup in my sauces which gives you bit more sweetness, kids love it. I will try this next time, it is interesting! I sweeten my spaghetti sauce all the time as I hate the acidity of some of the tomato pastes. Good stuff!